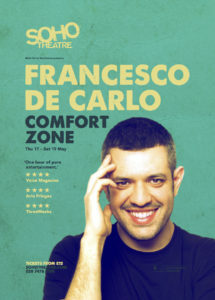 Francesco De Carlo is to bring his hit Edinburgh Show Comfort Zone to the Soho Theatre from 17th -19th May 2018. In this hilarious hour he asks – what do you discover when you decide to leave the safety of your sofa in Italy to become a foreigner in the UK, just as the UK decides to leave Europe? Because Francesco has done just that and he’s here to share his adventures and hilarious findings in this hit Fringe show. Francesco made his Edinburgh Fringe Festival debut in 2014 and firmly set his sights on his international career when he performed as part of the Comedy Sans Frontieres project alongside Eddie Izzard, Dylan Moran and Alex Edelman, produced by Mick Perrin Worldwide. His international career has since taken him across the world, performing in English in over 15 countries, including taking part in the Comedy Central International Showcase at JFL in Montreal and the #TrendingComics Gala at the Montreux Comedy Festival, and ultimately inspired Francesco to follow his childhood dream and move to London. However, with Brexit now looming, Francesco’s passion for politics has been reignited and he has taken a leap of faith and left his comfort zone for the UK. So far, he has joined Tommy Tiernan’s UK 2016 tour, Unspun with Matt Forde (Dave) and Paul Hollywood’s Big Continental Road Trip (BBC 2), Welcome to Wherever You Are (BBC Radio 4) and The Arts Hour on Tour (BBC World Service) proving that it was worth the risk! He has even charted his experience of moving to London as an Italian comedian during the Brexit negotiation period in his critically acclaimed and highly rated series Tutta Colpa Della Brexit (Blame it on Brexit) for the Italian national broadcaster, RAI 3. Comfort Zone is a wonderful mixture of personal and political stories, told with natural hilarious charm by a man who brings a uniquely personal take on the recent international political upheavals. He asks – in a time in which all around the world populist movements and xenophobic politicians are winning the elections – the value of democracy has been questioned, but, in reality, is it that we actually just don’t understand people anymore? And if that’s the case, maybe we could all benefit from leaving our comfort zones.